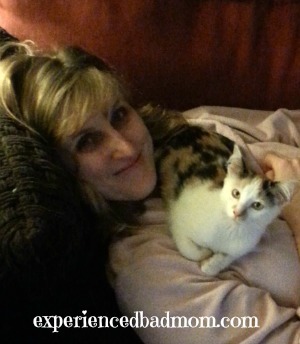 Those of you who have been hanging around the blog for a while know that we are a cat family. You may recall our beloved Mr. Tabbers went to kitty Heaven this fall. Our poor, crushed hearts were only resuscitated in December when we welcomed a new kitten, Scooter, to the clan. I have to confess it’s a big change. We went from having a blind, 14 pound cat who was 18-years-old to having a frisky, 3 pound kitten who can see. Just like with kids, I’m trying to provide Scooter with enough love, discipline, and food to make it in the world. I find that I’m saying a lot of things to the kitten that I used to say to my kids. In fact, the similarity between what I say to the kitten and what I used to say to my babies is almost eerie–as well as hilarious. 1. You are so cute! 2. You are hungry AGAIN? 3. I cannot believe something so BIG came out of someone so LITTLE. 4. Who’s Mama’s girl? Who’s Mama’s girl? 5. Ouch! You bit me! 6. It’s 4 am. Please stop crying. 7. Wow. You can fall asleep anywhere. 8. You are so stinky. 9. I love you sooooo much. 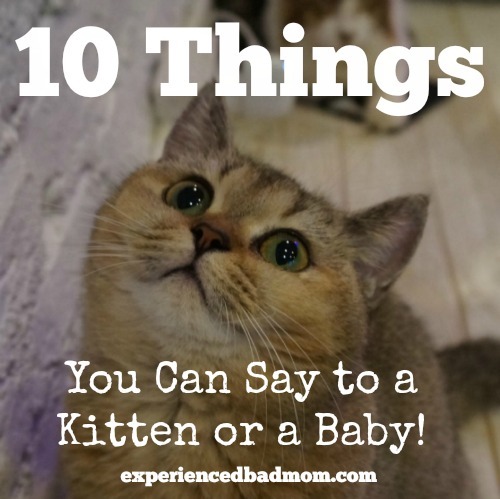 There you have it, the 10 Things You Can Say to a Kitten or Baby. What did I miss? Is there anything you say to a pet that you also say to the kids? What fur babies do you have? With both of my kids away I treat the dog even better than I did them. Apparently. Ha! Although I have to tell you we got our kitten when she was 3 months old and she was already using her litter box like a champ. Not one accident. If only babies were so easy! Very funny! I especially liked #3 – and I love both your fun cat names, too! Well, I could add that both my kids pretty much inched up to my neck while sleeping on my chest! More than once. “It’s 4 am. Why are you crying?” Oh yes the joy of babies, puppies and kittens. I remember when we had a new puppy she did the same thing. We were kind of prepared for the whole parenting thing a little more because of her. Your kitty is awfully cute! i love seeing the pictures on IG and Facebook! Jen recently posted…Introducing Jenerally Informed 3.0!!! Sarah Eliza recently posted…Crazy Stuff I’ve Seen in Texas: Freaky Signs Edition – The Skin Art Gallery, Legal Drug Store, & Cajun Fried Turkeys in a Warehouse! Featuring you this week!! 😉 Thanks again for joining the fun!! hahaha, so very true! :D! Thanks for the laugh!